The 1-1/2" Commercial Series Beginner's Kit is a great multi-purpose package that can make most log projects. With this heavy-duty kit, you can make beds, railings, coffee and end tables, benches and more. Used by homeowners, hobbyists, and commercial users, this semi-structural joint size will build your indoor and outdoor projects. 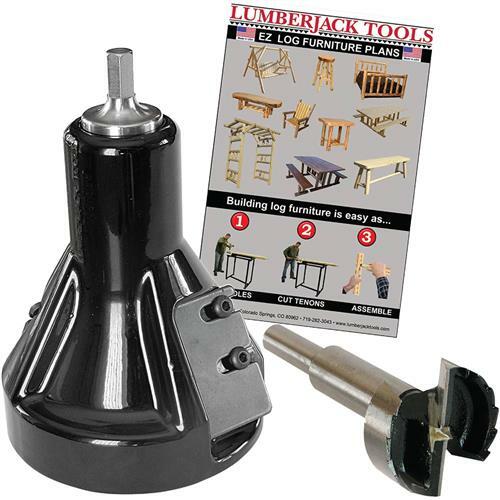 Kit includes 1-1/2" commercial series tenon cutter, 1-1/2" forster drill bit, and 10 Piece EZ Plan Booklet. Maximum tenon length is 3" and maximum log diameter is 4." Requires a single-speed 1/2" or 3/4" drill, less than 450 RPMS.